We do a prominent Real Estate Business in Bangalore. We do a prominent Real Estate Business in Bangalore. Bangalore has the potential to become one of the sought after destination of every business group from all over the world. Sanskriti Projects was started keeping in mind about the cross cultured immigrant population and the advantages of globalization. We specialize in understanding the individual requirements and attend to the client personally to cater them accordingly. We have the ability to get the best properties to its clients at the most fairest of all rates. We are engaged in all kinds of Real estate activities like Rental & Leasing, Buying & Selling, and Marketing & Promoting of Residential, Commercial, Retail Outlets and Industrial properties in and around Bangalore. We only believe in transparent transactions. We are officially outsourced Marketing team for many of the top builders, where a team does marketing in promotion of many of the projects on behalf of the builder shares and some projects of the land lord share. So, you can be assured best of the prices and discounts from us. Jakkur is a very good locality. Jakkur is near to Yelankha and Devanahalli airport fastest growing area in Bangalore near Hebbal, maker circle, Ms Ramiah hospital, Hennur ring road Manayatha tech park ,good to invest in north Bangalore, good rental income near by good school. Jakkur is a very good locality. 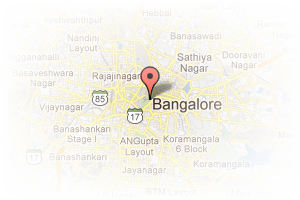 Address: 10th Cross, CBI road, Ganga Nagar, Bangalore, Karnataka, India. This Builder Profile page for "Sanskriti Projects" has been created by PropertyWala.com. 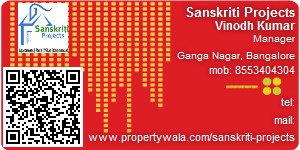 "Sanskriti Projects" is not endorsed by or affiliated with PropertyWala.com. For questions regarding Builder Profiles on PropertyWala.com please contact us.